The North Eugene community empowers students to be thoughtful and compassionate individuals who will live and work in a complex and diverse global society. We support each student for life beyond high school by fostering their academic, social and emotional success. Students will prepare for post-secondary options and acquire the knowledge and skills required to thrive in a rapidly changing world. 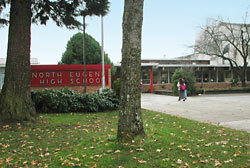 North Eugene High School has a long and proud tradition in the River Road and Santa Clara communities. An outstanding and deeply caring staff believes in the potential of every student. North Eugene High School has a variety of exciting programs designed to support student success in high school and beyond. Commitment to diversity is evidenced by staff leadership (which includes an equity committee), unity-themed assemblies, affinity groups such as MEChA and Gender Sexuality Alliance, and curriculum such as Courageous Conversations class—an opportunity for students to learn and practice the skills needed to accept and respect one another. North Eugene is an International Baccalaureate World School; every student has access to the IB diploma program and career-related program. All students are able to pursue a rich and rigorous curriculum in every subject area. Our curriculum includes college preparatory courses across all content areas, advanced science and math courses, relevant experiences in language arts and social studies, and a variety of fine, applied and performing arts, in addition to health and physical education classes. An involved and diverse student body means a multitude of clubs and a full range of 5A athletic programs. Dual credit options: Several courses offer LCC College Now credits: Spanish, science, math, woods, music, child development and digital media.